Jon Ford at Dbeere Yachts tells me he's closed on the sale of the 24.4m motor yacht Noah White in an in-house deal. 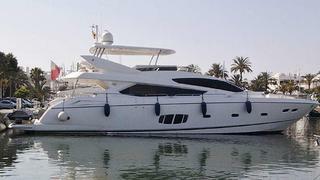 Noah White is a Sunseeker 80 built in 2010 and has had only one owner. Her large flybridge is fitted with a GRP hard top plus a retractable canopy and has a spa tub, dining area and wet bar. Noah White comes with with the largest engine option available - twin 1,830hp MTUs giving her a top speed of 29.4 knots and cruising speed of 24 knots. An interior in satin wenge wood and white soft furnishings throughout accommodates 10 guests in four staterooms. The midships master suite is full beam while the VIP stateroom is set forward. Twin port and starboard twin cabins each has a Pullman berth and all staterooms are en suite. A spacious aft cockpit has dining facilities for 10 guests. Noah White was asking €2.25 million.